It was one of those days which called for ultra light dinner after an over dose of south indian breakfast and lunch. We were in no mood to indulge in masala dosa's or rice and its accompaniments. 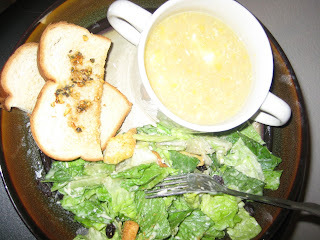 Therefore I thought why not treat ourselves with a soup and a store bought salad along with garlic bread ... All the preparation required was 20 mins and we were at the dinner table enjoying the soup and everything. This soup is a must try and the best part is it can vary to suit vegetarians ,non-veges and eggetarians. Coarsely grind the sweet corn. Make sure you dont grind it to a paste. There should be some kernels to bite into.In a thick bottomed vessel heat the broth . Pour the coarsely ground sweet corn into the broth.Let it come to a boil. Add soy sauce,salt and pepper. Whisk the beaten egg white into the boiling soup.Whisk continuously so that the egg white do not form a lump.Serve hot with garlic bread. Tastes yummy! !